I was born there in 1978, less than a mile from the house where King grew up. As a schoolchild, I like others, visited Atlanta’s Auburn Avenue—the street where King was born, worked, died, and is honored. To see King’s neighborhood, and the home he was born in, humanized him for us children, letting us know that he was once young like us, wrestling with classes and playing with siblings. We went to the historic Ebenezer Baptist Church, where King declared, “If you want to say that I was a drum major, say that I was a drum major for justice,” and to the headquarters of the Southern Christian Leadership Conference, the organization he led until his death in 1968. We visited the King Center built by his widow to spread King’s nonviolent doctrine, and saw the eternal flame that burns near his tomb and reminds us that his work endures. My grandparents—native Floridians who first came to Atlanta as college students in the late 1930s—and my mother tried to shield my brother and me from the indignities they suffered during the era of Jim Crow. They did this mostly by trying to give us a better life; I seldom spoke to them about the racism they endured. But the living history was everywhere in Atlanta, and the frequency with which I saw King’s lieutenants and associates on television reminded me of both the progress we’d achieved and the work still left to be done. 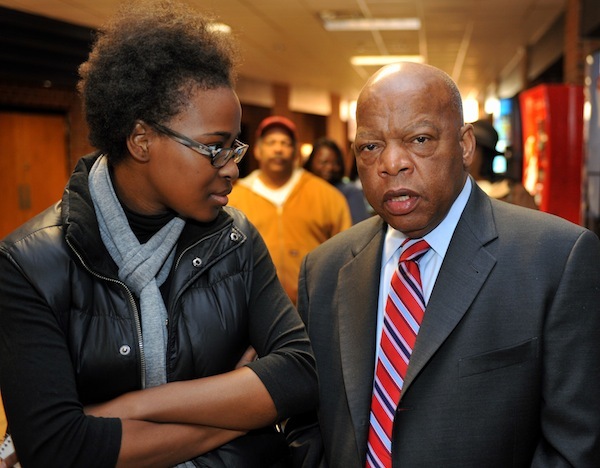 John Lewis, for example, was leader of the Student Nonviolent Coordinating Committee when he was gassed and beaten badly on the Edmund Pettus Bridge in Selma, Alabama, in 1965, during the start of a march to the state capitol that came to be known as “Bloody Sunday.” But he went on to represent Atlanta as a U.S. congressman and has fought for decades to preserve the Voting Rights Act he, King, and hundreds of foot soldiers helped usher into law. When I became a journalist, I found myself gravitating toward telling the stories of black people, and focusing specifically on the legacy of the civil rights movement. As a college student, I got my first reporting job at the Atlanta Daily World, a black newspaper first published in 1928. The office was on Auburn Avenue—the same street I’d first visited as a child. I was working blocks away from where King worked. By taking on civil rights as a beat in Atlanta, I not only had a front row seat to history, but the ability to ask those who lived it how they felt about current-day racial struggles. It was an extraordinary opportunity. Even though I have left Atlanta, I carry all this history with me. This fall, almost a half-century after the enactment of the federal Civil Rights Act that King supported, I spent a few weeks in Ferguson, Missouri, as a reporter for Fusion covering the Michael Brown shooting and the ensuing protests. From the day I arrived, the parallels between the Ferguson context and that of King’s struggles were everywhere. Even though segregation is no longer legal and discussion of the civil rights movement has appeared in textbooks for decades, I still found neighborhoods in Ferguson so divided along color lines that I thought I had stepped into those black-and-white TV images of the 1960s I had seen. 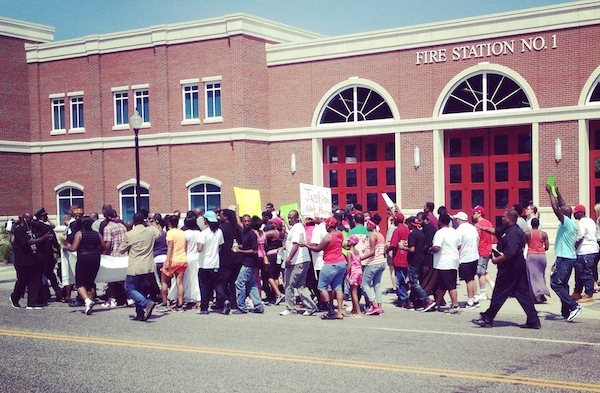 In the same way Bull Connor referred to King and other protesters as “outside agitators” in Birmingham, authorities and some residents in Ferguson referred to “outsiders” and the “negative influence of the media” on the African-American community—as if this community had no grounds to be unhappy of their own volition with the status quo before August 9, 2014. I talked to people on both sides of the racial divide who did not know each other’s daily lives. The way the police deployed tear gas, dogs, smoke bombs, and riot gear certainly reminded me of stories I’d been told by people like Lewis. Images of clashing police and protesters in Ferguson—and the real-time reactions on social media—reminded me of the nation’s horror at the sight of water hoses, clubs, and snarling dogs 50 years before. The Ferguson rallies, both there and elsewhere in the country, were full of young people—much like those during the civil rights movement. But there were important differences, too. Unlike the masses who rallied around King in Alabama, there was no single leader of the protests I covered in Ferguson night after night. The shooting of Michael Brown had been the catalyst, but inequality—and specifically unequal treatment of black people in the criminal justice system—was the real subject, one with many stories to tell. During the 1960s, the black church had a central role, serving as the moral foundation of the movement. In Ferguson, churches served as the site of several rallies and meetings, and preachers could regularly be seen keeping the peace on the front lines during protests. But the burgeoning movement was neither started nor maintained through the church. And while the protesters on West Florissant Avenue were mostly peaceful demonstrators, there were some who would have disappointed King—looting, committing arson, firing guns. There are some who think of the events in Ferguson as an isolated incident, simply a moment in time. But to me it seemed like part of the continuum in the struggle for progress in our country. When I interviewed King’s aides, they were always quick to mention that the civil rights movement didn’t die with King; it’s ongoing. While our nation has made racial progress, we still have far to go before we achieve full equality among America’s citizens. The reaction to what happened in Ferguson exposed that chasm anew. is a journalist whose articles, essays, and interviews have appeared in numerous outlets, including Fusion News, The Guardian, The Associated Press, and The Washington Post. She currently serves as vice president of print for the National Association of Black Journalists and lives in Washington, D.C.
Lead photo courtesy of Ross Finlayson. Interior photos courtesy of Errin Whack.